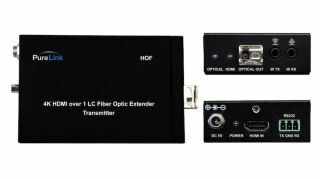 PureLink's OLC III Tx/RxThe What: PureLink has added the HOF1 Tx/Rx and OLC III Tx/Rx One-Fiber Extension Systems for HDMI and DVI to its line of HDTools long-range extension solutions. Both models feature modular/detachable transmitter and receiver pairs that simplify integration and ensure fast, secure communication between input and output devices. The What Else: The HOF1 Tx/Rx provides reliable extension of Ultra HD/4K HDMI, embedded audio, RS-232, and bi-directional IR to distances up to 1,000 meters, all over a single-strand multimode fiber optic cable. The OLC III Tx/Rx extends DVI content up to 300 meters using multi-mode fiber optic cabling to deliver high speed, HD video signals, EDID data, and HDCP over fiber in real time. The HOF1 Tx/Rx HD supports resolutions up to Ultra HD/4K (4096x2160 at 24/25/30Hz) to distances up to 1,000 meters. HDCP 2.2 compliant, it supports a variety of audio formats, including LPCM 7.1 audio, Dolby TrueHD, and DTS-HD Master Audio, features full 3D compatibility, and auto-EDID management. It has a built-in repeater to correct and enhance signal quality, and locking power supplies. OLC III Tx/RxHD provides DVI extension over a single-strand, multimode fiber optic cable, with reliable, long-range extension of 1080p content at distances up to 300 meters. HDCP compliant with auto EDID management, the compact, detachable transmitter/receiver module allows for easy integration.